The properties of FRP are resistant to the soap, chemicals and water, to which the grating and plate are constantly exposed. Fibergrate FRP products will not rust or rot under these conditions, as steel would. The grating was light enough to be easily removed for inspections and cleaning. The slip resistant surfaces of the grating and plate provide solid under footing. The owners were looking for a product with a slip-resistant surface that would not rust and would not require any supplemental treatment to prevent rust. 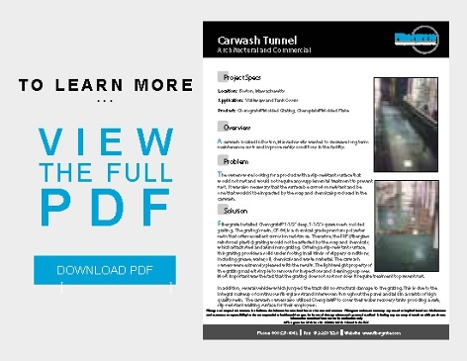 It was also necessary that the surface be corrosion resistant and be one that wouldn't be impacted by the soap and chemicals produced in the carwash. Fibergrate installed 1-1/2" deep, 1-1/2" FRP square mesh molded grating. The grating's resin is a chemical grade premium polyester resin that offers excellent corrosion resistance. Therefore, the FRP grating would not be affected by the soap and chemicals, which corrode steel and aluminum grating. Offering a slip-resistant surface, this grating provides a solid under footing in all kinds of slippery conditions, including grease, water, oil, chemicals and waste material. The carwash owners were extremely pleased with the results. The lightweight property of the grating made it simple to remove for inspections and cleaning purposes. Most important was the fact that the grating is corrosion resistant and does not require treatment to prevent corrosion.